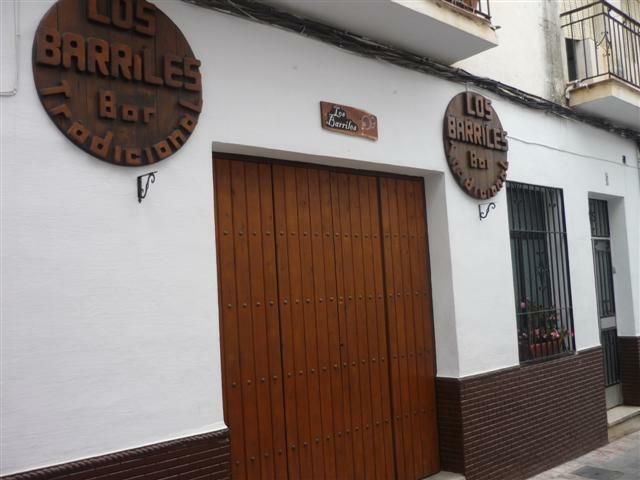 UPDATE WINTER 2015/2016: Los Barriles is currently closed, but will be reopening in brand new premises on Calle San Jose (the side street that runs from Calle Cristo to Pintada). The existing bar is being re-furbished, but will not have the same owner when it re-opens. We will update this page when the new bar(s) open. 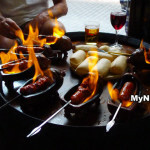 The speciality of this popular evening only tapas bar is the "Chorizo al Infierno". 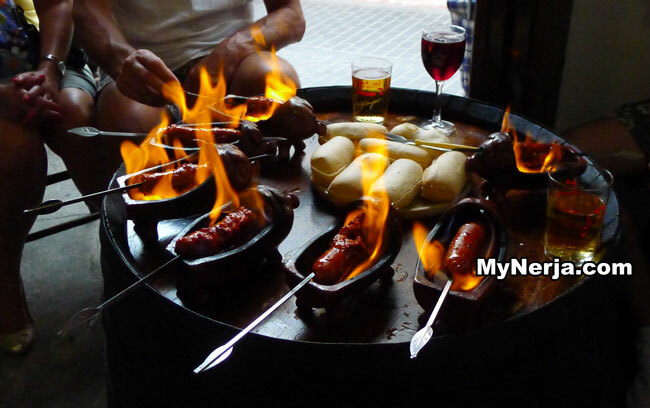 This fiery sausage is cooked by yourself at your table. The owner, Rafa, will bring you a pig shaped ceramic bowl for the sausages to be cooked in, and once the fuel is alight you are left to tend the skewered chorizos. Its great entertainment, and tastes fantastic too. 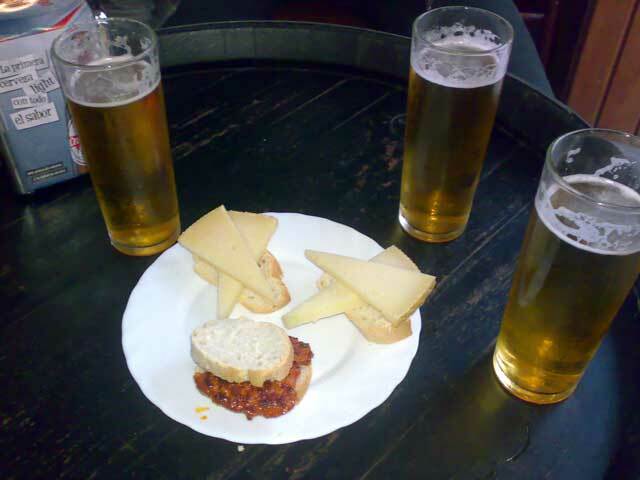 If you just want a tapa, that is free with your drink. 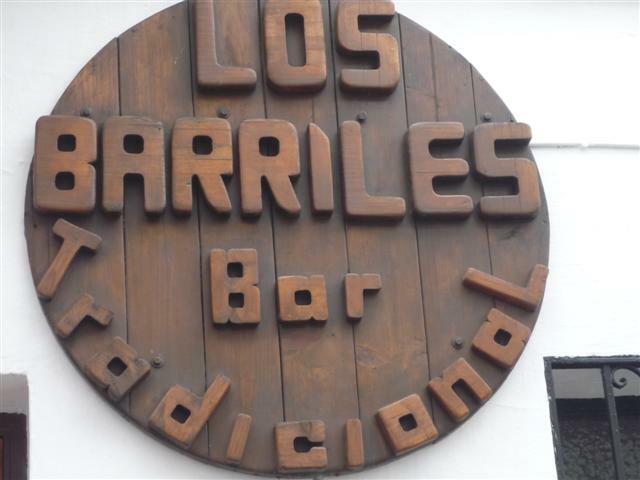 Los Barriles is small and busy and old fashioned, what more could you ask for? 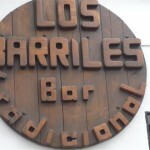 Visited the new Los Barriles in Calle San Juan recently. What a great job they have done, and it is so good to see them in business again. Definitely recommended. 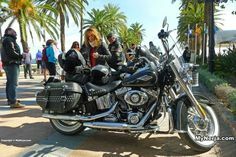 If you have visited Los Barriles you can leave a comment and star rating at the bottom of this page. Posted in Bars, Old Town, Tapas Bar, by Marqueemoon on Tuesday 22nd of March 2011. If you have visited Los Barriles please rate it now by clicking on the stars below, then leave your comment using the form at the bottom. We were also over in early September (very HOT!) and managed to catch Raffa in his new bar, it was still a Work In Progress and I did manage to take a picture of Raffa in his new domain. All the walls were tiled and part of the bar was in but not plumbed in. There is also a glass panel in the floor near the entrance showing a basement. When we asked Raffa what was going to be down there he said “Disco” – but with a definite twinkle in his eye! It’s a shame I can’t post photos on here. We have been in Nerja for 6 weeks and we have walked past Rafa’s new place several times, but the doors are still firmly closed. I hope that whatever has been causing the holdups is resolved soon as it must have been very stressful for them and they have missed out on a lot of income. Their old place has been transformed into another eating place for the masses. Pictures of food adorn the outside, and they have plastic covers over the tablecloths. It will never be the same, as a lot of the charm was that it appeared to have been untouched and original, giving an authentic Spanish feel. The new place, Bodega de Antonia, is actually very good. 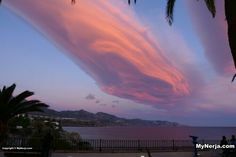 The staff are friendly, the tapas is varied, always extremely nice, and you often receive quite a large portion. You get large port a from the menu as well, so definitely worth a visit. It’s run by the family that have La Taberna around the corner in Cristo. Just because it’s not like it was before shouldn’t put anyone off – otherwise a lot of the bars in town would be empty, as most of them have changed dramatically over the years. We have tried Bodega de Antonia. Perhaps we were not so lucky as you. No smiles, brusque service, table wiped with wet cloth before we were finished and even though it was perfectly clean. It was not busy. It is just a pity that possibly the last unmodernised premises could not have been retained. 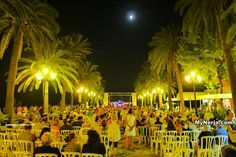 It attracted so many tourists and locals, and the wandering troubadours, and gave character to Calle Carabeo. Just my opinion. Thank you for the update Barry. So pleased to hear that at last they have been able to open. Don’t know what the delay was, but they must be so pleased to finally be back in business. Will certainly frequent their new establishment. They are such nice people and I hope that they do well. What’s the latest with the “new” Los Barriles? When we were over in May it was little more than a shell. I also heard that no building is allowed in the summer. Is Rafa working anywhere else in the meantime? spoke to Raffa early September and he was suitably harassed at the delay in opening. As he drew his finger across his throat he called the builders ‘ bandidos’. He told me he hopes to open October. Los Barriles is moving to Calle San Jose next to El Molino bar. Spoke with Rafa today (14/7/16) and he hopes to be ready in August. Place is a complete building site and this may be aspirational but hope he is right. 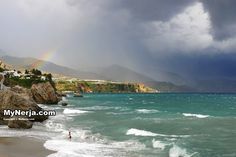 Third visit to Nerja and not the same without our daily to Los Barriles just isnt the same. On the plus side it was great to see Rafa if only for 5 minutes. Saw Rafa today at new place. Not ready yet but looking good. Old place has just become another restaurant like many of the others. Can’t understand why people change such a winning and popular formula. Good luck Rafa with new place. Does anyone know where the owners have relocated to? I have heard he is in the process of getting a new bar set up near Molino Bar, not sure when it will be opened yet. Barry noticed in sol talk magazine that the owners of Los Barriles have moved on to a new bar near to molino bar. Do you know the name of the bar he has moved to and also is Los Barriles still open under new management. The new bar is just a building site at the moment, but is at the end near to the Dutch shop. Old Los Barriles is being refurbished and was not yet open when I passed it a few days ago. Went down Calle San Jose to check progress, there’s a lot of work to do before it is finished. There’s a sign up saying that it is the site of the new Barriles. Meanwhile the old site has been refitted and has opened up under a new name and owners. 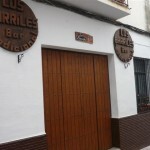 los barriles is moving to calle san jose (at the top end of Post Office St). Closing in original bar December 2015 hoping to open new bar June/July 2016. Heard this week that the bar is shut up and the signs are taken down. Does anybody know if this Is true? With out a doubt this is our favourite bar in nerja we have been going in for a long time now maria and Rapha are lovely and great hosts see you you both soon . Best bar in Nerja. Visit there every year and just love it. Have just taken my daughter there after driving her all the way down from Barcelona where she has lived for 9 years and she agreed it’s the best bar in Spain. Everyone has to cook a chorizo! 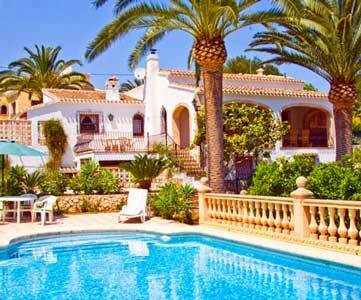 Hope that Rafa & Marie-Carmen are open this week as we arrive 6th May!! 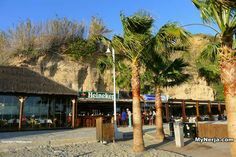 Looking forward to visiting our favourite bar in Nerja. 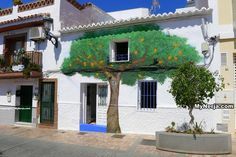 We always make our way here when we’re in Nerja,go in have a drink and ask for the”” cheese and cheese, try the “chiorzo al infernio, soak up the authentic atmosphere, not to be missed, the owners are fun & friendly. Lots of character and great cheese! I’ll be back! one of the best and the most friendly. Have to agree with the last comment. Well worth a stop on a tapas trail in this part of town. 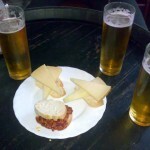 Great place to start your tapas trail, followed by Desvan then up the hill to Los Niños.